The last Quirky Food establishment I profiled was Cheese-ology in St. Louis, a restaurant that only served macaroni & cheese (sadly, they closed in 2015.) Now, I’m really stretching myself and moving on to write about a place that only serves grilled cheese. Can you tell that someone likes cheese? Cheesie’s in Chicago opened last year, but I didn’t get around to checking it out until recently. I was surprised this place only offered 7 varieties of sandwich, plus a sandwich of the month. They also serve fries, soup and salad. They actually have one grilled cheese with macaroni & cheese stuffed inside. Now that is cheese overload! I tried the Tradicion, with chorizo, jalapenos and chihuahua cheese on Texas toast, as well as the Melt, which had chicken, bacon, cheese and tomatoes. Both were pretty good, though I was expecting a bit more zing in terms of flavor. The enchilada soup was hearty, but the chili was too greasy. Cheesie’s is really small, so it’s a good place for takeout. It’s right in the busy Lakeview neighborhood under the train stop. They do have a handful of small tables and a bar if you get there early. Grilled cheese may not rank up there with deep dish pizza, Chicago hot dogs, and other famous Chicago food, but it’s still a fun place to visit. They’re open reasonably late too, so you can stop in for some carbs after having a few drinks. 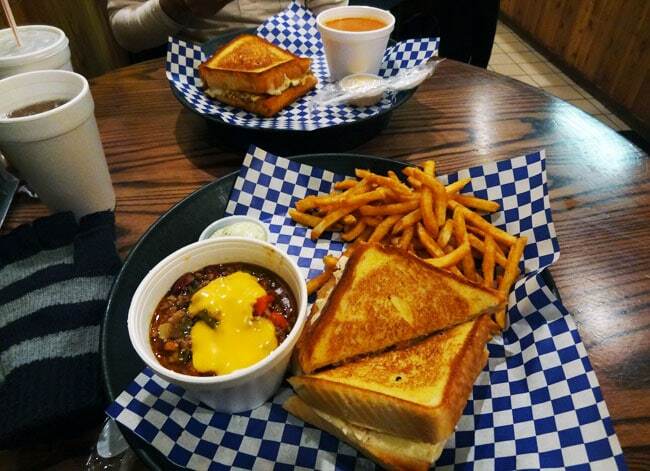 Would you eat at a restaurant that only served grilled cheese? Only grilled cheese??? Hell yeah, count me in. Sure, sounds good. Chicago will be my featured destination for April, so stay tuned for a lot more posts about the city! As a fellow cheese lover, I approve. I’ve been to a grilled cheese food truck in DC and it was tasty. Ah, that sounds good! Food trucks are always worth checking out. Sure! Although I’m not that big on cheese, I’d have a grilled cheese sandwich anytime. I’d never heard of the chihuahua cheese. I wonder how it tastes. I’ve gotten into the chihuahua cheese since it’s on a lot of dishes at Mexican restaurants around here. Absolutely! I love grilled cheese. And it has to be good if they specialize in it. I’ll be eager to see how the business does as more time goes on. Ohhh, I loooooove cheese ~~ your food photo is looking really good on this stormy rainy night in SF. This time of year is perfect for grilled cheese. I’ve eaten from a food truck that only does grilled cheese. It was awesome. Especially the B&B melt that had Benton’s bacon and buttermilk cheddar. That is a food truck I would support.